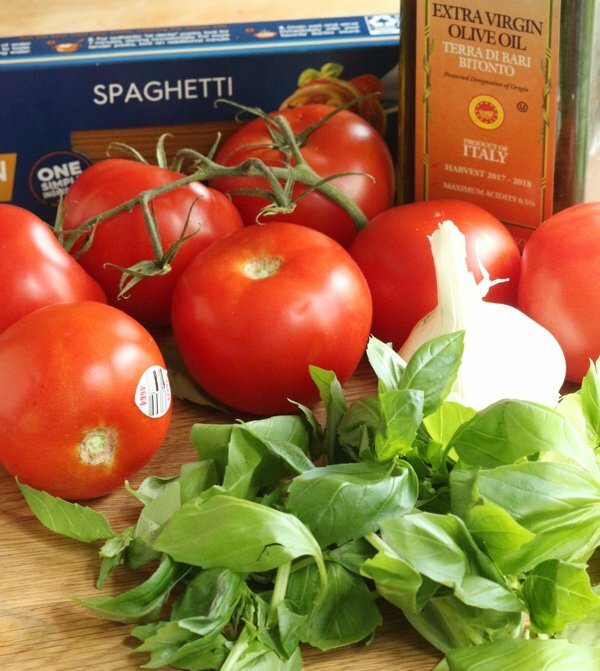 This is the fresh tomato sauce recipe for now! Those tomatoes are literally rolling into stores and farmers markets and this is the time of year that they taste the best. This year, I taught how to grill tomatoes and I made a delicious cold tomato soup but there is nothing like fresh tomato sauce. It is so easy to make this – if you haven’t done it - you will wonder where it has been hiding all these years. The key, of course, is the freshest tomatoes you can find. Those Styrofoam tomatoes will not work in this recipe. Just an aside about the pasta. I use only whole grain pasta (just like my bread). You can’t miss it in the pasta aisle and it comes in all the different shapes. 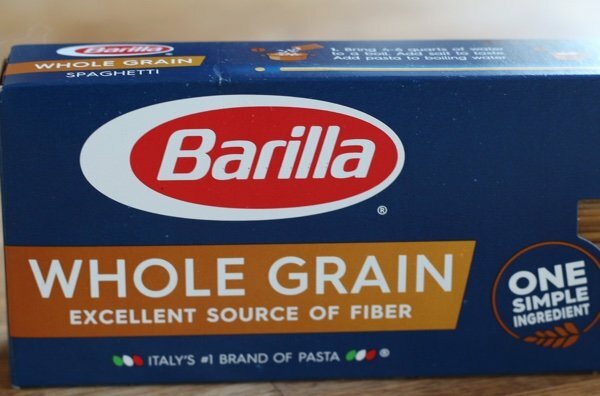 In one serving of angel hair (2 ounces), there is 7 grams of fiber and 8 grams of protein in this pasta – which is made with one ingredient – whole grain durum wheat flour. Does it taste okay? YES! It is all about what you put on it. I like the nuttier flavor but it isn’t that different than the regular white flour pasta. Back to the sauce!! All you do is roughly chop the tomatoes – no seeding or peeling is necessary. Then you mix it with some fresh basil, garlic, olive oil, and a little salt and pepper and let it sit while you do other important things. That’s it!! To heat it up, you serve it on top of the hot pasta and you can add some grated Parmesan cheese if you are feeling fancy. 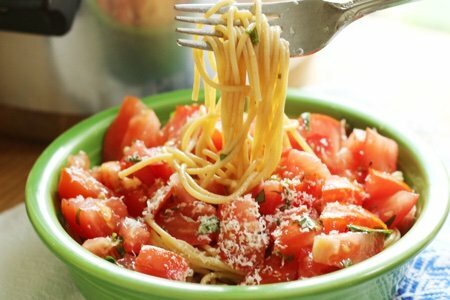 The time it rests allows the tomatoes to ooze out their juices and the pasta soaks it up when you toss it. This sauce is so good!!! Don’t feel like you need to eat this on pasta. You can put it on grilled bread or pour it over spaghetti squash or zoodles. Do you make fresh tomato sauce? What do you use in your recipe? 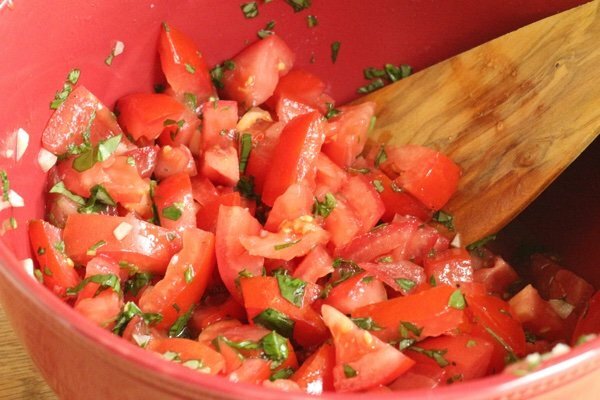 Mix tomatoes, basil, olive oil, and garlic in a medium bowl. Leave (covered) at room temperature for 30-60 minutes. Serve over pasta, bread, or squash. Can this be frozen if you make a big batch? 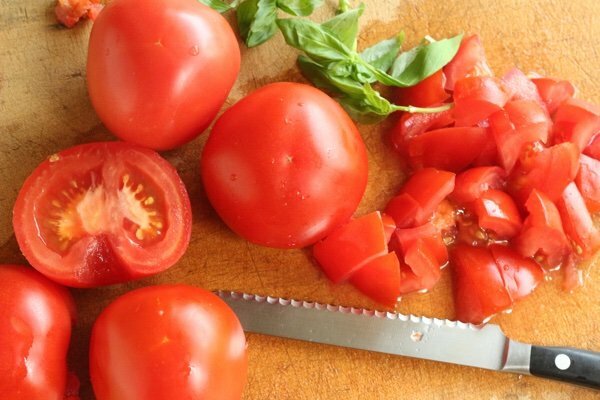 Cooked tomatoes are actually more nutritious than raw. This looks good but I will heat it up. 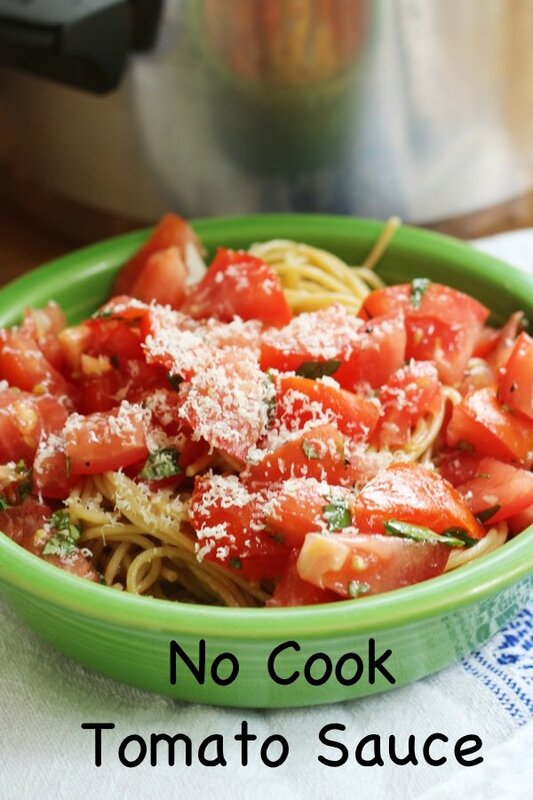 This works well with canned tomatoes too. Fresh basil is a must though. I've made this before and eaten with freshly baked spaghetti squash - it was delish! The heat of the squash brought out the flavor of the tomato, basil, etc. YUM!